I’m a good planner. I like to set myself a goal and write up a plan for reaching it. I’m also a bit of a perfectionist, which made the first dinner parties I organized a bit fussy and very stressful for me. Experience has helped me sort out which tasks are key to a successful evening from those that are just making life harder. A table set for thirteen for brunch at Mother’s Day 2010. Decide how many people you want at your table. Your guest count will dictate what kind of dinner you’ll be preparing: 4 to 8 guests (plus hosts) is ideal for a seated meal. More guests can mean it’s easier to plan a cocktail party. Send your invitations well in advance so as to make sure your friends will be there. Three weeks is a safe bet. If you’re inviting more than 6 people, send your invitations at least a month in advance. When your guest list has been finalized, find out if any of your guests have allergies or food restrictions so that you can plan your menu accordingly. I like to choose a theme when I plan a dinner party. 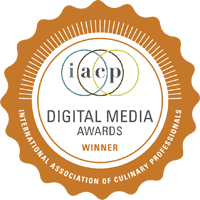 Whether it’s a cuisine (like Indian), a particular ingredient (all-pumpkin menu!) or a single type of dish for all courses (small bites, soups), setting a theme makes the evening more interesting. It’s also wise to balance your meal: if some of your courses are very rich, end your meal with a lighter dessert. And vice versa. 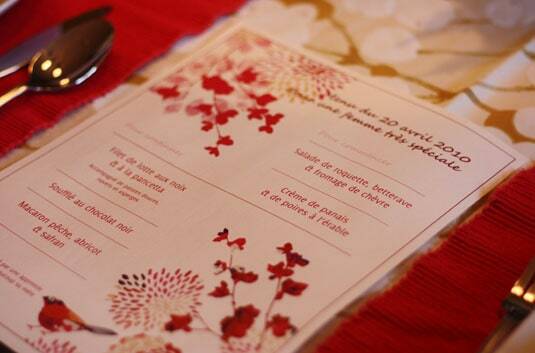 The menu I printed for my Mom’s dinner party last April. Your guests may bring wine as a courtesy gift. 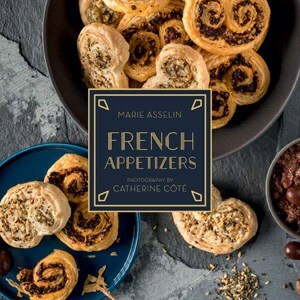 Save them for later and serve cocktails and wines that pair up with your food perfectly. The internet, cooking and wine books and wine shop vendors are good sources of knowledge to consult when choosing your drinks. 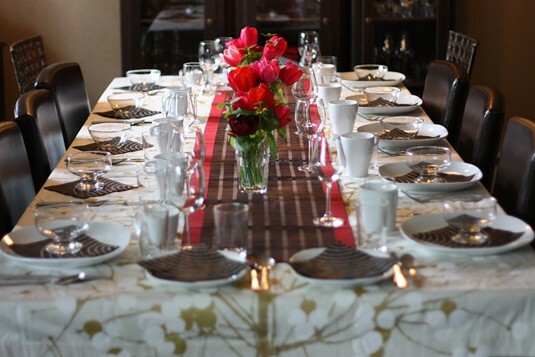 Taking just half an hour to set a beautiful and colorful table will put your guests in the right mood. The color palette, table linens and tableware can all be edited to fit the menu. Candles and fresh flowers are a plus. Don’t forget the music: a good playlist will complement the best conversations and fill in the blanks when your guests are busy eating. 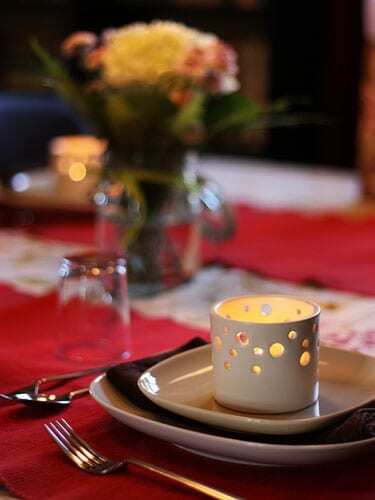 Candlelight and flowers make a table pretty. The last but most important advice of all: your guests won’t be happy if they see you scrambling and running around all the time instead of being with them. If you plan your menu well, with the right balance of dishes you can make in advance, you’ll be able to enjoy your meal, not just serve it. I prefer keeping my guests outside the kitchen, but don’t hesitate to ask for help if you need it. I’m writing this post from a small studio in the heart of Trastevere, Rome. My Italian kitchen is minuscule and ill-equipped, my table seats two people and my friends are thousands of kilometers away. Instead of hosting my dinner party right away, I decided to scour Rome to taste the best local dishes and to book a market tour to find the most authentic ingredients to bring back home, when I will invite my friends and cook them the tastiest Roman meal they ever had. 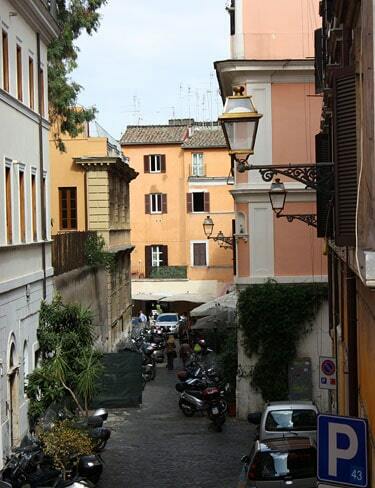 The view from my Roman apartment, in Trastevere. La Cucina Romana is defined by fresh and seasonal ingredients cooked simply, without fuss. My guide for the market tour, Eleonora, is a foodie, blogger and travel consultant and she has been a goldmine of information. I was lucky enough to spend the whole day with her, touring a market, enjoying countless tastings and visiting specialty shops around the historic center. With Eleonora’s advice, and my own research tastings in Roman restaurants, I’ve written my menu. Not all courses are originally Roman, but they are all staples here, and the way the meal will be served is typically Italian. Antipasti platter: I bought everything for my platter at a fantastic Testaccio gourmet store called Volpetti. 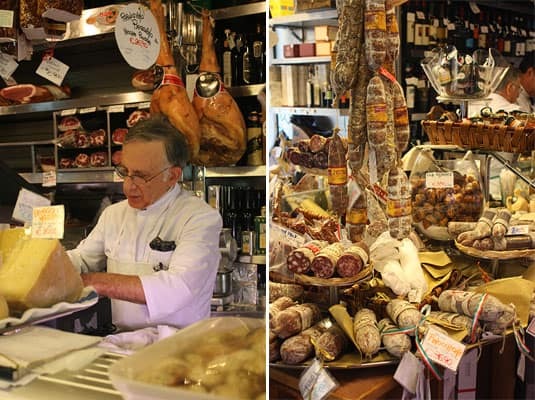 It is socked with the best cured meats, cheeses and condiments Italy has to offer. Italians go there when they want to buy something extra-special. The staff is extremely helpful and allowed me to taste more than a dozen products before I chose what I wanted to buy. At Volpetti: one of the brother-owners, the incredible array of salami to choose (and taste) from. 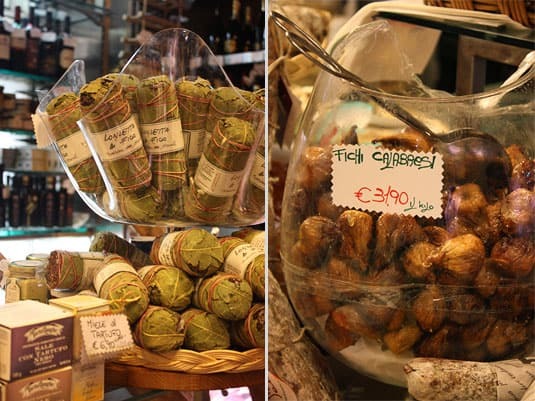 Left: the special fig “salami” made of fig pulp pressed with spices, nuts and other dried fruits; right: oven-roasted figs (no sugar added!). Bruschetta & crostini: Toasted bread seasoned with garlic, olive oil and sea salt is a classic throughout Italy. To try something new, I will also make Eleonora’s Mortadella Spread. Primi Piatti: Pasta is always served before the main course in Italy. Cacio e pepe and Amatriciana (tomato with pancetta) are two classic pasta dishes that are found on almost every Roman menu. 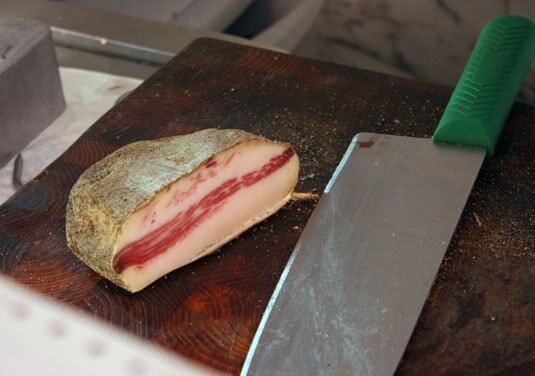 Instead of pancetta in my Amatriciana sauce, I will use guanciale, a special Italian cured bacon made from pig cheeks. A generous piece of guanciale was given to me (yes, for free!) by a butcher we visited on the market tour. It’s like that in Italy: when you’re loyal to your merchants (my guide has been visiting this butcher for many years), they thank you. 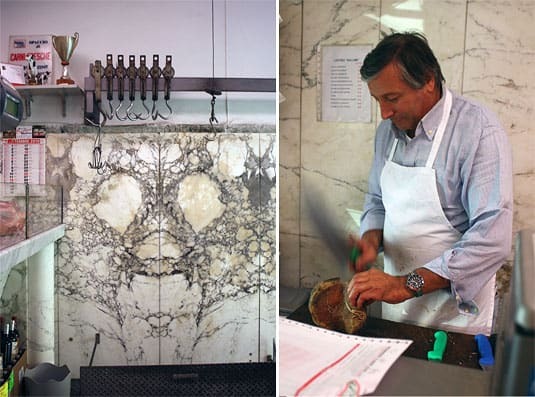 The friendly (and rather stylish) butcher in Testaccio. The luscious piece of Guanciale that was so generously given to me by the butcher. A plate of creamy Cacio e Pepe. Secondi Piatti: Involtini alla Romana is a popular dish in Rome, and I’ve tasted a beef-based version at the very good Da Lucia restaurant in Trastevere. It is a dish that looks fancy but can be prepared in advance. Contorti: In Italy, the meat and fish courses are served on their own and you have to order sides separately. 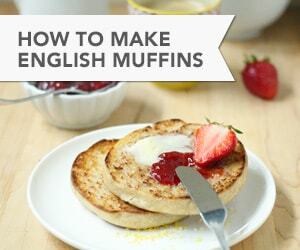 They are most often very simple, like a salad or a plate of sautéed vegetables. 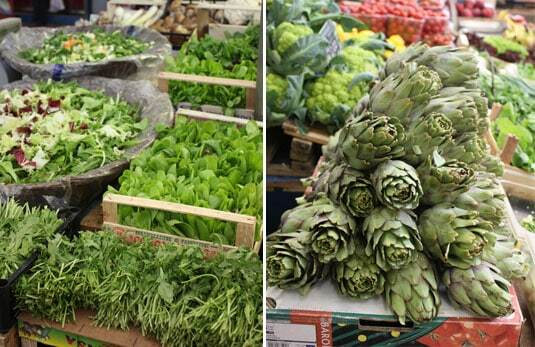 Fresh vegetables at Rome’s Testaccio Market. 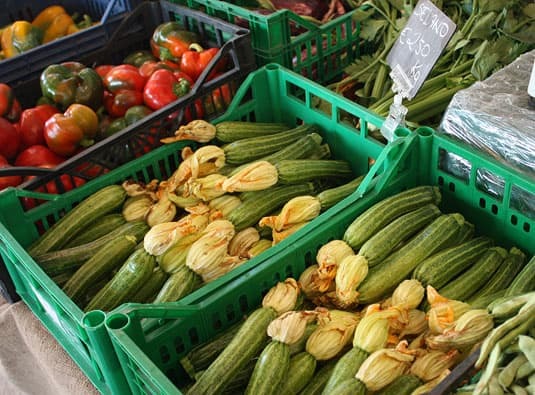 In season zucchini sold with their flowers, which can be stuffed with mozzarella and fried (a very popular snack in Rome). 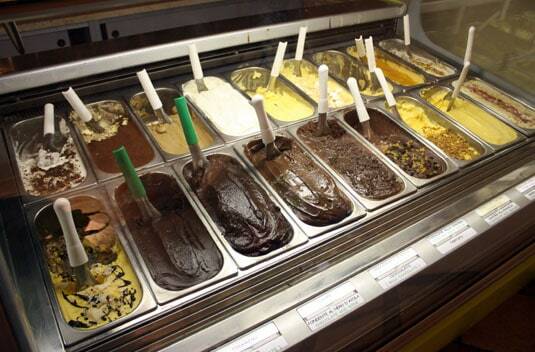 Dolce: Romans don’t have a heavy hand on sweets, and dinner often ends with fresh fruits or a simple gelato. My gelato is inspired by La Gelateria Del Teatro, where I first saw the luscious red wine and chocolate combination. 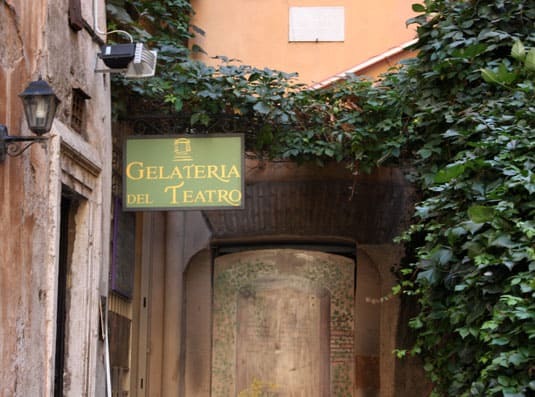 La Gelateria Del Teatro in the center of Rome. The array of chocolate- and milk-based gelati at La Gelateria Del Teatro. My suitcase is filled with premium-quality products, my heart with souvenirs from Rome and my mind is already with my friends, sharing this wonderful meal. This is my entry to Project Food Blog 2010 Challenge #3. If you liked this post, click here to vote for me. Voting is open from Oct. 4th through Oct. 7th. A big thank you to all who voted for me in the first and second challenges! 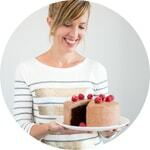 You can also read my Project Food Blog profile, follow me on Twitter and Facebook or subscribe to my RSS feed. Is it okay to place part of this in my personal web site if perhaps I post a reference to this site? Please do not copy & paste my content to your site, but it’s absolutely ok to link to the article. Thank you! OMG I'm so sorry I missed this post!!! Thank you thank you thank you so much for all the lovely mentions, links and love. I'm reading this too late to vote, isn't this ironic?? I've been nursing this stupid flu and have been off the grid for a few days. Sincerely hope you pass this next step. It's ok Ele, I know you're busy and I sure hope you're feeling better by now! I had such fun in Rome with you, I can just hope I can make it back as soon as possible to discover more of this amazing food capital. I think you've seen my gnocchi post by now, I'm very proud of them! Your family recipe worked pretty well. Managing to do them in my Roman apartment inspired me to try new variations back home! But first, I'll do my Roman feast… I'll post pictures so you can see if I did well! LOVE it. You totally got my vote and I actually found your blog because I'm trying to make macarons for the first time tonight. It's been a challenge. 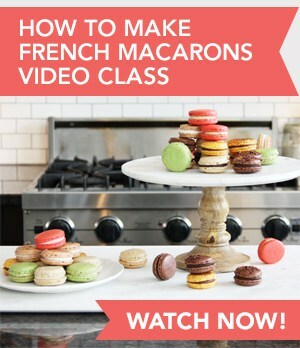 Your 'how to make macaron' post is wonderful and very detailed. I wish I would have read it before I made mine. I think I underbaked mine because the crusts didn't hold their shape and the insides looked a little doughy. THEN my filling was too runny. It was one thing after another. I had like five turn out okay. My macaron post is indeed a very popular one! I struggled with making my own for a while and figure I surely wasn't the only one. 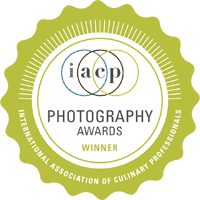 I'm happy to know that some people find it enlightening – so many things can go wrong when you make macarons! I believe you can follow others' instructions and recipes but in the end, you really have to come up with your own that make you succeed with you oven, your equipment, your ingredients. Tweak a little thing here and there, don't give up and you'll be rewarded! I will post recipes for the dishes in my menu later on when I come back home! If you prepare any of the dishes, we can share our experiences! Everything looks awesome! Love your menu! Hope we both make it to the next round! :-) You have my vote! Thank you Jessica! Your post was also great, loved the autumnal theme. I especially liked the vertical pear salad! A great idea and what an impressive presentation! Good luck to you. Can I be invited to this dinner party when you have it? 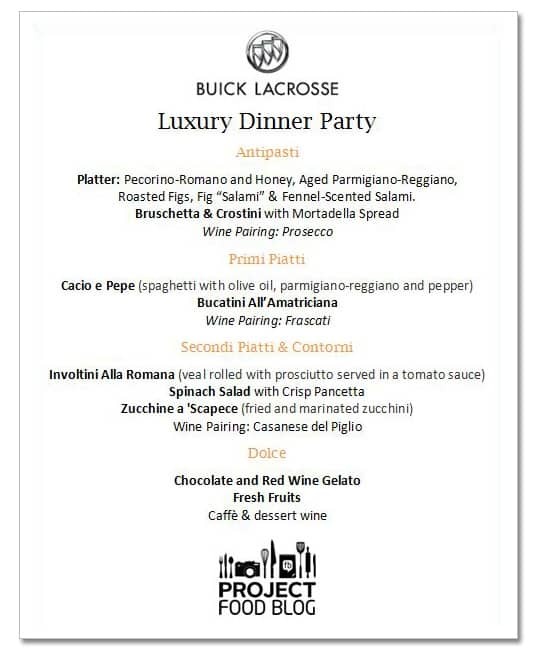 I love Cacio e Pepe so so much and knowing that you're bringing all the goodies back from Rome means you're definitely going to have one luxurious party. I'm so impressed that you wrote an entry even though you're on vacation! I'm sending a vote your way – can't wait to see your post for the next round! 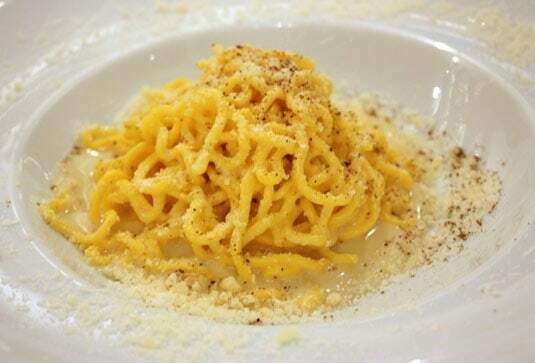 I admit that I never tasted (or even heard of) Cacio e Pepe before going to Rome! What did I miss all these years? I will for sure make it again and again at home. Rome is very inspiring and I have a lot to write about it. I just hope my readers won't get too bored! Thank you for your vote, I'm really hoping to make it to the next round. oh wow! I had to vote for a dinner in Rome! I used to live there. I loved revisiting it through your culinary eyes. I wish I could say I lived in Rome, what a chance! Renting an apartment always makes you feel more like home, even if it's just for a week. I really enjoyed my time there and I hope it shows in my post. Thank you for your comment! Trastevere is my favorite neighborhood in Rome! So jealous! Great interp of the challenge! Thank you Amy! I hope my interpretation is going to cut it to the judges' eyes. I really want to make it to the next round, I already have it ready to be published! Good luck to you in the challenge. well im officially jealous! awesome post! So nice. We've gotta get to Rome! Yes, you really must! It's one of the best foodie cities I've ever been to. What a delicious menu, and such gorgeous shots. I want to be invited to one of your Rome dinner parties! Thank you Russell! I have to admit that Rome is so inspiring, it's very difficult to take bad pictures here :) I really can't wait to cook this Roman menu at home! Great take on the challenge Marie – very creative thinking.. Good luck and OMG I am so jealous of you right now. Rome!!!!!! Thank you Mardi, I did what I could! We'll see how it goes.